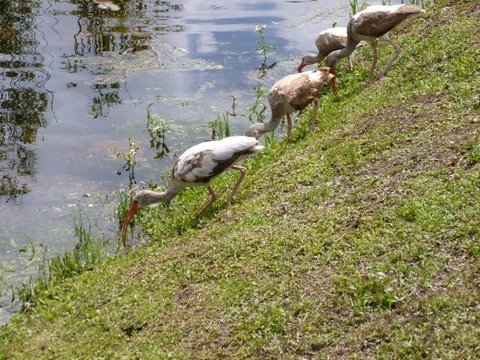 White ibis are probably the most common wild birds found throughout Florida and the Florida Keys. This is due to the State's diverse water sources and subsequent plentiful food supply. Gregarious by nature, these wild birds usually congregate in large groups, even feeding with birds of other species such as the wood stork and great blue heron. 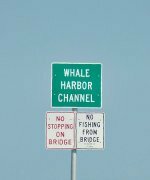 They're also adaptable to a wide variety of areas including salt and fresh water marshes, lagoons, swamps, and urban areas. 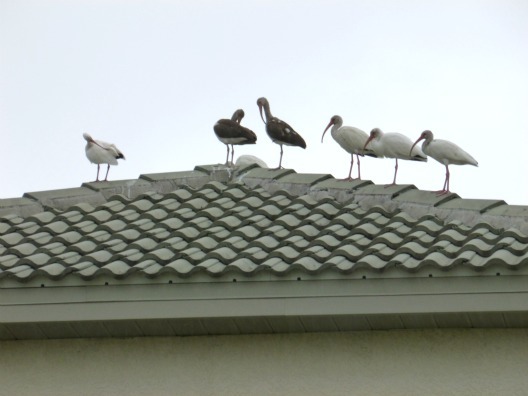 A daily Florida occurrence is spotting small or large groups of these birds feeding on lawns, perched on roofs, or wading through shallow water pecking and probing around for food. 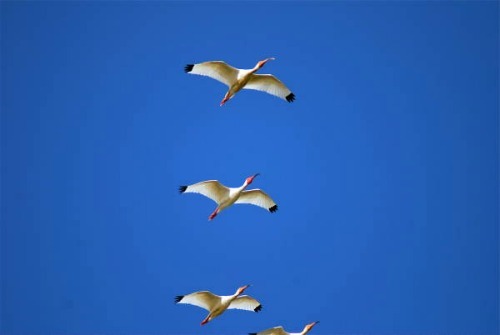 These birds are such a common sight in Florida and the Keys that actually seem to blend into the scenery. Seen so often, they can easily be missed or dismissed. 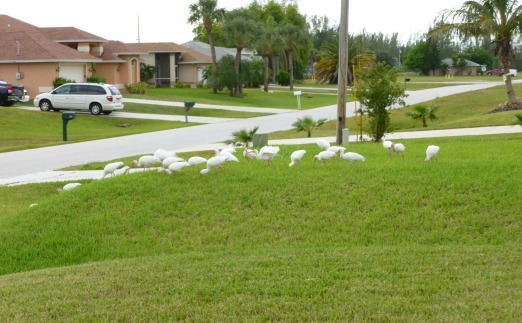 Despite this fact, one thing that makes the ibis stand out, is their socialness. Not particularly afraid of humans, they walk and peck along beside or near you. They gather in large groups oblivious to people and other animals around them. Their true social nature combined with their physical characteristics, especially their curved beak, are just some of the reasons why they are a favorite among so many bird watchers. Unlike some species of birds, these are also very easy to identify. Adults have primarily white plumage with pinkish faces, and black tips on the ends of their wings. Several other noticeable characteristics are their long, downward hooking beaks which are a bright deep pink and orange color, and their long skinny legs which have a reddish hue. The adults of this gregarious bird species average about 2 feet in height with a 3 foot wing span. The males are slightly larger and have longer and thicker bills than the females. These birds also have a relatively long life span. In one instance, a wild bird was found 16 years after being banded. In captivity, the longevity record for this species is over 20 years. Like the wood stork and the roseate spoonbill, these birds feed by probing - they're not a visual hunter like the great blue heron. Instead they poke their beaks into lawns searching for food such as grubs, worms, snails, frogs and toads. If they're in shallow water, they'll move their long, downward pointed beak side to side until they touch a shrimp, crab, worm, small snake or minnow. They then quickly grab their prey and eat their catch whole. These birds also have unusual calls that would be hard to describe as even remotely melodic. Their normal sound is similar to the noise humans make when imitating the honking of a car horn. Depending on what they're doing, and the age of the bird, they'll make other sounds but these are equally...unusual. These commonly seen birds are primarily monogamous, although the males have been known to stray from their mating female. Both are active in the nest building process which is usually located in a tree or shrub, but nests are also made in a covered area on the ground. Typically 1 - 5 brown splotched, pale blue-green eggs are laid, and both parents are involved in the 21 day incubation period. During this time, the male continually stays on guard to protect his mate and nest from predators and other ibis. Once the eggs hatch, both parents help with the daily feeding of their hungry young chicks by taking turns. The female usually forages during the day, and the male hunts at night. This way someone is always present to watch and protect the nestlings. Like most white birds, when the chicks hatch they're not white. Instead they're covered with a gray down which changes to a dark brown-black on their heads and wings. Their chests are bare and the skin is pink. Within about 2 - 6 weeks the plumage begins to form and comes in as a light brownish gray color. Their faces and bills become pink after the plumage fills in, but the legs stay gray. Once their feathers have come in, the juveniles are mostly a soft brown shade with their rump, and under areas being white. The legs begin to change from gray to a light orange hue. Over the course of the next two years the feathers begin to molt and the new feathers on the back and wings come in white. By the third year, the feathers on the head and neck are white, and the bird has finally reached full adulthood and sexual maturity. 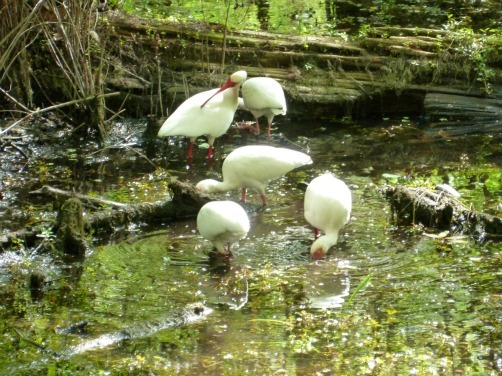 When on your Florida Keys vacation you'll find that spotting white ibis is about as easy as finding an alligator. Extremely prevalent, they should replace the plastic pink flamingo, and take over it's coveted lawn jockey status popular throughout the region.